15 1/2" x 13 7/8"
Easily glide your hot and ready pizza pies right out of the oven using this 16" x 17" American Metalcraft 2616 standard blade short handle wood pizza peel. The wooden handle offers a grip which is comfortable, sleek, and smooth, allowing you to transport your pizza creations confidently and efficiently. Also, since the blade is made of wood, it can be sealed with oil or seasoned with whatever spice you choose, whether it's salt, pepper, oregano, or basil. This not only adds flavor to your dough, but cuts back on burns or scorch marks. Wooden peels are also better at holding the pizza on the peel and are gentler on the pizza than metal peels whose slick, sharp surfaces can inadvertently slice or cut pizzas. And your customers will love the rustic charm! The short, 9" handle is perfect for easy maneuvering. 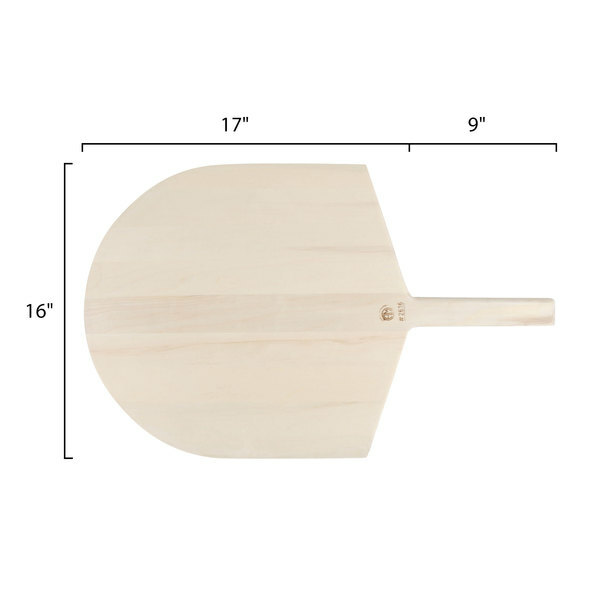 The American Metalcraft 2616 is an wonderful quality made wooden pizza peel that is the perfect size for use with small home sized ovens. It's a single solid piece of wood, light weight and smooth surfaced. A light coat of Emmet's Elixir Wood Conditioner, also bought from WebstaurantStore, and its set to launch pizzas or even act as a serving board. I should note however that whatever wood its made of isn't very "thirsty" and didn't absorb too much oil and thus likely won't absorb spilled sauce, grease, etc as easily so this aids in cleanup. Big enough for any normal sized pizza with a short handle that is perfect for small or home kitchens, the small handle also necessary for its dual role as a serving board. The price is pretty great for a wood board of its size. All in all, a great wooden peel for a great price. This pizza peel works great. The dough didn't stick to the peel and I was able to get it in the oven without the pizza pie getting ruined. It also worked when I was removing the pizza from the oven. It's made of good material. This is large enough for my supersize pizzas, but the short handle is perfect for my narrow galley kitchen. A longer handle would have been awkward to maneuver without hitting the cabinets behind me. I'll drill a hole in the handle in order to be able to hang it from a hook. 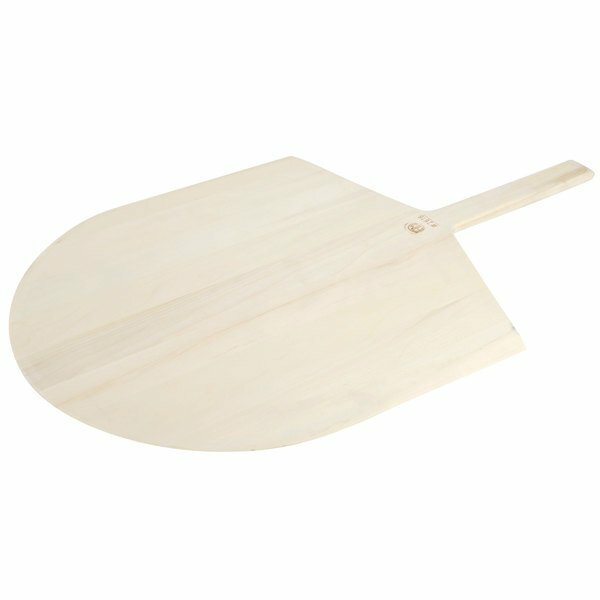 Bought two of these wood pizza peel with 9" handle. One for our hand tossed and a separate one for gluten free pizzas. We love the long handle and wood is great quality. really like this pizza handle. it can handle very high heat. it is a very nice product it is very easy to clean and its a good price.